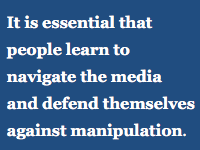 More than ever, there is a needed skill for identifying & fact-checking news. 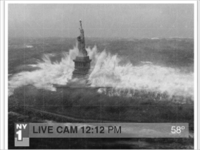 News can be fake! But our LibGuide is not! 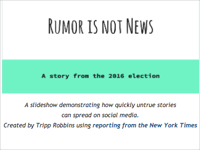 Discover how fake news is spread, why people create it, and what we can do to avoid it. 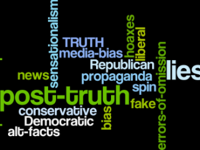 The Oxford English Dictionary defines “post-truth” as “relating to or denoting circumstances in which objective facts are less influential in shaping public opinion than appeals to emotion and personal belief. 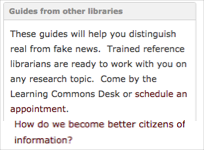 The American Library Association defines information literacy as "possessing the set of skills to recognize when information is needed and have the ability to locate, evaluate, and use effectively the needed information." 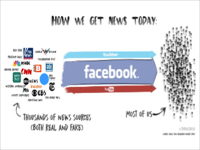 Many of the "news" items that come across your social media feed are there to sell advertising. 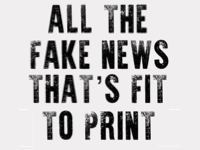 There is an incredible amount of information and misinformation available; news and fake news, truth and alternative truths, viral hoaxes, and social media filters and bubbles. What do we - or should we - believe? 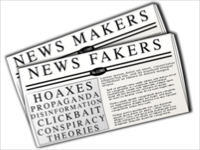 Unlike news satire, fake news websites seek to mislead, rather than entertain, readers for financial or other gain. 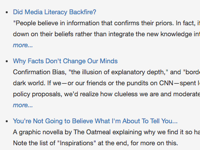 This topic guide will provide you with tools, strategies, and additional resources to help you cultivate informed skepticism about the information you encounter on the Internet. 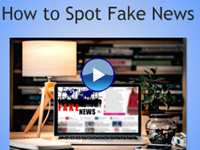 The ability to tell accurate news from fake news is an important skill that you will need not just during your studies, but for the rest of your life. 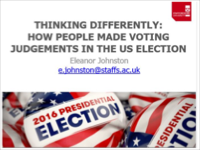 This Subject Guide will give you valuable insight and tools to tell the fact from the fiction. 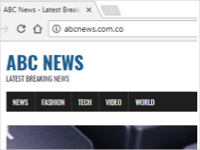 ... the creators of fake news and fake news sites check verified news sources. They use facts from verified news sources and layer it with misinformation to confuse the reader. 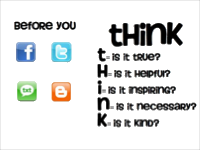 Before you post, THINK: Is it True, Helpful, Inspiring, Necessary, or Kind? 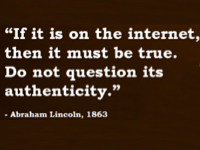 As the means of communication and persuasion become omnipresent, it is easier for falsehoods to become widespread. 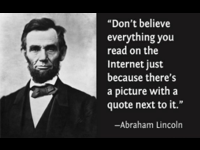 The "Post-Truth Era" refers to the social phenomenon wherein people are more apt to believe what they want to or what they feel should be correct based on personal beliefs, rather than on concrete evidence and fact. 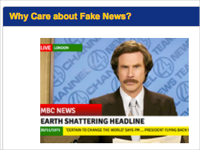 This LibGuide stores the resources from a Teachmeet we held at Staffordshire University in May this year that looked at Information Literacy and Fake News. 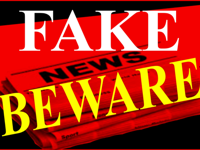 Fake News may take many different forms, but the essential element is always that it is partially or completely false. 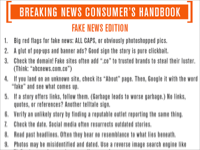 This guide explores fake news and provides practical tools for quickly evaluating the credibility of information. Analyzing what we see and hear is vital to a functioning, healthy citizenry. 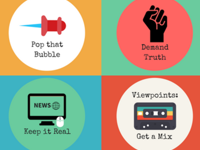 This guide will provide you with tools, strategies, and resources to help you cultivate informed skepticism about the information you encounter on the Internet, and shield yourself from the dangers of consuming and sharing dubious or incorrect info. 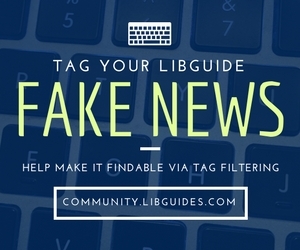 We started this guide as a direct request from the Lexington community for help in differentiating between fake news and the real deal! It went live 1/6/17 and has had 16,340 views to date. 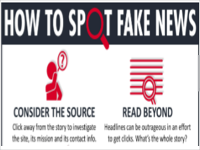 This guide offers some useful tips and advice on spotting lies, partial truths, propaganda, biased reporting, and "fake news." 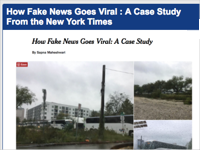 What makes a news story fake? It can't be verified, it appeals to emotion, authors aren't experts, it can't be found elsewhere, and it comes from a 'fake' website. 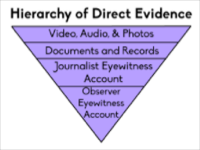 Media Literacy is the ability to access, analyze, evaluate, and create media in a variety of forms. 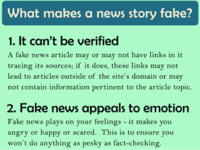 This guide will give you valuable insight in telling fact from fiction online, plus a chance to exercise your newfound skills. Because the quality of information varies tremendously, anyone can register for a site and post whatever they want, most sites don't employ fact checkers or editors. 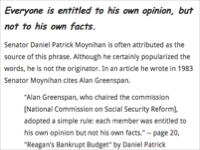 Everyone is entitled to his own opinion, but not to his own facts. Senator Daniel Moynihan is often attributed as the source of this phrase. Although he popularized the words, he is not the originator. 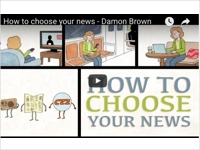 What is news literacy? 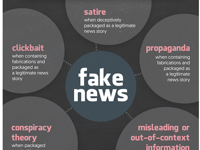 News Literacy is "the ability to use critical thinking skills to judge the reliability and credibility of news reports, whether they come via print, television, or the internet." Unlike some of the search results you will get from a web search, the published articles in database are almost always written by professionals and reviewed by an editor, which improves reliability. 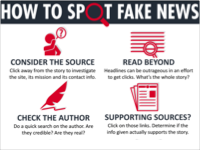 Guide to navigating 'fake news' found primarily online. 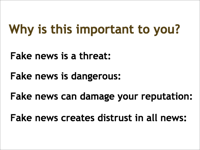 These are confusing times for consumers of the news, and the issue of which media outlets should be trusted is as demanding and critical as ever. 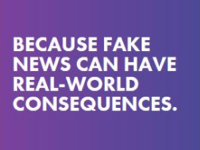 Fake News is when a news source, print or web based, publishes knowingly false statements. Fake news includes articles that are made up and untrue.